After the structure is defined, its time to fill in with some dummy data. Lets assume we have the below data. Our DB is defined. Time to write some code! We make changes to our existing Repeater Control adding a Literal control that will hold all sub menus of parent menu. An important thing to note in this markup is we have handled the “ItemDataBound” event of the Repeater control. In the code file (.master.cs/.aspx.cs/.acsx.cs), we will make a call to our database to get all the categories and bind the data to the repeater control. For doing this, we will write the below code.
" + item["CategoryName"] + "
If you see the code above, most of the code is similar to our previous post. So, I will explain the remaining part in this post. 1st of all we are binding only parent categories to the Repeater control in GetCategories(). 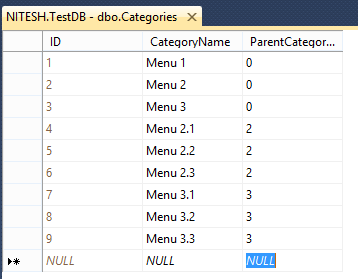 Secondly, we get all categories in a separate DataTable (lets call it Main DT for this post in future references) which we will use in the rptCategories_ItemDataBound() event handler. Inside the event handler, we check if the current item is a valid Item(while binding Repeater control fires this event for binding header and footer rows as well). If yes, we get the ID of the current record and filter our main DT where ParentCategoryID = ID of the current record so that we have all child categories for the current menu. Once filtered, we create a dynamic HTML string using <ul> and <li> tags and finally assign this text to the Literal control defined in our .aspx page. At this point, you’re done with your main coding part and as always you need to apply CSS to the menus. Add the below CSS to your .css file and execute the application. You will see the output something like below. Hope you like this post! Keep learning and sharing folks!